Despite division titles in each of his first two years at Florida, Jim McElwain enters 2017 needing to find an answer at QB or risk going the way of Ron Zook and Will Muschamp. GAINESVILLE, Fla. — Jim McElwain sat about 10 rows off the floor at Exactech Arena on Tuesday night as Florida’s men’s basketball team beat South Carolina. He wasn’t entertaining a recruit; official visits don’t start again until September. He simply took in a game and shook the hand of the occasional high-roller or well-wisher. With a new football complex in the planning stages, there is money to be raised. With two SEC East titles in his first two years at Florida, there also is plenty of well to be wished. McElwain and Florida’s administration would love to see this image repeated until McElwain’s hair is gray and he’s ready to retire. The Gators want a football coach who can become part of the fabric of the athletic department community the way Steve Spurrier did during his 12-season reign from 1990–2001. No coach since has been able to repeat that. Ron Zook and Will Muschamp didn’t win enough. Urban Meyer won two national titles, but his tenure fell apart too soon because of health issues to establish any lasting connections. The challenge for McElwain is earning the kind of time it takes to forge those bonds. He must satisfy an athletic director (Scott Stricklin) who didn’t hire him, a booster group being asked to dig deep into its pockets and a fan base spoiled by two football national titles and two men’s basketball national titles in a three-year span that wasn’t that long ago but feels increasingly distant. 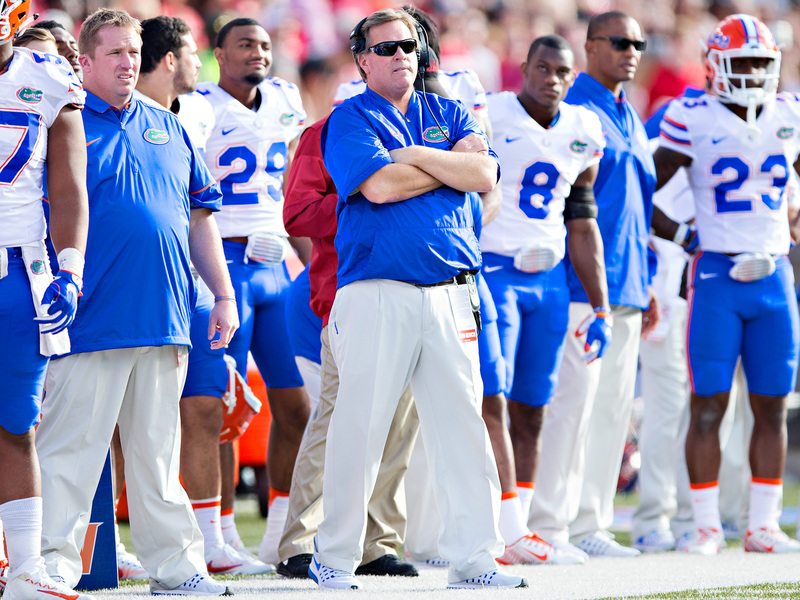 Of all the coaches in the Power 5, McElwain might be in the strangest position. Boil the job down to its most basic requirements, and he has done exactly what he was hired to do. But from a big-picture standpoint, he needs to make significant strides during the next two seasons or risk suffering the same fate as Zook and Muschamp. If he makes those strides, however, he could enjoy the kind of success Spurrier and Meyer did. That’s what makes this spring practice so important. The key to the kind of improvement McElwain and his constituents desire is developing a quarterback. The Gators have been snakebit at the position since Tim Tebow left following the ’09 season. Muschamp now admits he made a mistake hiring Charlie Weis as his first offensive coordinator in ’11. Weis’s successor Brent Pease then passed on offering a scholarship to Deltona, Fla., quarterback Paxton Lynch, who probably could have kept everyone employed. Muschamp got fired late in the ’14 season. Had he managed to beat South Carolina in an overtime game, he and then-coordinator Kurt Roper might have kept their jobs. That would have given Florida a legitimate shot at signing Lamar Jackson. Instead, Jackson went to Louisville. Muschamp-era signee Will Grier emerged as a potential star in McElwain’s first season, leading the Gators to an improbable comeback against Tennessee and whipping an Ole Miss team that won 10 games. But Grier tested positive for a banned substance that October and got suspended for a year. During that suspension, Grier and the coaching staff decided they’d be better off parting ways. He’s at West Virginia now, and Florida still doesn’t have a stable quarterback situation. This spring, McElwain and offensive coordinator Doug Nussmeier will evaluate a competition between redshirt freshmen Felipe Franks and Kyle Trask. Kadarius Toney, a high school quarterback from Eight Mile, Ala., whose recrutnik-designated position was Athlete, also will take snaps this spring. Luke Del Rio, last season’s starter, remains on the team but will miss spring practice following shoulder surgery. He’ll be allowed to compete for the job when he returns, but it’s possible one of the youngsters may have all but locked it up by that point. The Gators need to upgrade at quarterback to lift an offense that has ranged from pedestrian to abysmal in McElwain’s first two seasons. In ’15 and ’16, Florida ranked 104th in the nation in offensive points per drive. The Gators ranked No. 102 in the nation in yards per play in 2015 and dropped to No. 105 last season. After losing defensive coordinator Geoff Collins—now Temple’s head coach—and eight starters from a statistically dominant defense, Florida needs to get out of the hundreds on offense to make progress. Despite complaints from Muschamp and McElwain about the situations they inherited at Florida, each man came into a stocked defense. Muschamp, a former defensive coordinator, was tough to score on with the defenders Meyer left him, and he left a host of future NFL players behind for McElwain on that side of the ball. Now McElwain is almost out of Muschamp recruits on defense, but don’t expect that side to drop off a cliff. Collins and successor Randy Shannon have restocked on that side, and plenty of young players got experience last year filling in for injured starters. 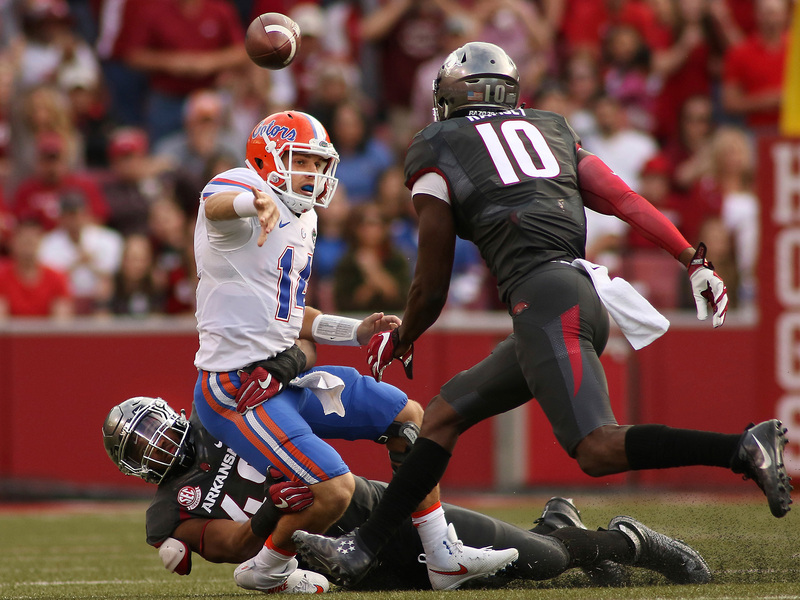 Despite the talent drain, Florida’s defense should still keep games close no matter what. That’s why the big questions remain on offense. Significant improvement could turn Florida into a team that could win a third consecutive SEC East title and then actually challenge the West champ (just assume Alabama) in the SEC title game instead of getting steamrolled. Stagnation could lead to a significantly worse season if Georgia and/or Tennessee can effectively harness the talent on their rosters and compete for the East title. Here is the fundamental issue for McElwain. Florida’s administration, boosters and fans expect the Gators to compete for national titles. They expect the Gators to win SEC titles. Winning a weak SEC East looks good on paper but isn’t enough long-term. It also doesn’t help McElwain that the Gators have a non-conference measuring stick sitting 150 miles northwest of them. In McElwain’s two games against Florida State, Florida has averaged 3.3 yards a play, scored zero offensive touchdowns and lost by a combined score of 58–15. Those losses resonate year-round because Florida State’s coaches never hesitate to mention them as they go head-to-head with Florida coaches recruiting from the same talent pool. To make Florida’s stakeholders happy, McElwain’s team will have to legitimately compete with Jimbo Fisher’s team. The good news? A team that can compete with the current iteration of Florida State can compete with anyone. But the Gators won’t have to wait until November to see where they stack up against an excellent team. They won’t even have to wait until SEC play. The last time Florida left home to open the season against a quality opponent was 1987, when the Gators opened at Miami. Thirty years later, Florida finally will play another opener away from The Swamp when the Gators face Michigan on Sept. 2 at AT&T Stadium in Arlington, Texas. That Alabama-Clemson game set the tone for a period of Crimson Tide dominance under Nick Saban that continues to this day. Certainly, McElwain would love the kind of dominant win that portends future success, but he’d probably be happy with a functional offense and any kind of win. Michigan must replace 17 starters, but defensive coordinator Don Brown remains. Brown’s defenses tend to suffocate inferior offenses. If Florida isn’t any better on that side of the ball, it won’t take half a season to figure that out. The alarm bells will begin ringing furiously. If the Gators have improved, it also should be obvious from the start. Florida has new coaches for the offensive line (Brad Davis) and running backs (Ja’Juan Seider). The line, a shambles when McElwain arrived, is serviceable but must improve as it returns four starters from the Outback Bowl win against Iowa. Junior Martez Ivey will move from left guard to left tackle to replace David Sharpe, who departed for the NFL. Jawaan Taylor returns at right tackle. T.J. McCoy, who went from third team to starter at center because of injuries last season and played well at season’s end, likely will be the center. The great unknown for ’17 remains at quarterback. Coaches didn’t think Franks or Trask was ready last year, and that wasn’t surprising. The lanky Franks needed time to bulk up and adjust to the speed of the college game. Meanwhile, Trask came from a situation where he didn’t even start in high school. He backed up current Houston receiver D’Eriq King at Manvel (Texas) High, and his parents didn’t believe in school hopping. He impressed college coaches during camps, and that’s how he wound up on Florida’s radar. Trask captivated coaches and teammates with his arm strength during camp last year, but Franks steadily improved over the next few months. Now, McElwain will place the pair in as many competitive situations as possible to determine which signal-caller might be capable of leading the offense in the fall. Toney will get his chance as well because Florida’s coaches need to examine every option. Choosing the quarterback for this season might be the most critical decision McElwain has faced since arriving at Florida. And the choice he makes might wind up determining how long and how fruitful his tenure will be. Bill Paxton died Sunday at 61 due to complications arising from a surgery. In honor of a man taken away too soon, here are his top five characters. We’re sticking to movies and television series, so sadly his role as the radio operator in Pat Benatar’s “Shadows Of The Night” video will not be honored. Ripley was the ultimate badass, but no one told Hudson. A nerd’s perfect Alpha-male brother. This was also Paxton’s directorial debut, but his performance as an end times zealot was positively terrifying. He made flying cows seem romantic. 1. Ole Miss received a new Notice of Allegations from the NCAA last week and self-imposed a bowl ban for the 2017 season. That, plus the scholarship sanctions Ole Miss suggested last year, probably still won’t be enough for the Committee on Infractions. 2. SI’s Pete Thamel talked to people with experience dealing with cases before the Committee on Infractions, and the most interesting aspect of this case is what happens to Ole Miss coach Hugh Freeze. He’ll be the first high-profile football coach to face potential punishment under a penalty structure created in ’12 that allows the COI to suspend a head coach between 10% and 100% of a season because he should have known what his assistants and staffers were doing. We’ve seen suspensions handed down to Syracuse basketball coach Jim Boeheim and former SMU basketball coach Larry Brown, but football is a different animal. 3. Oklahoma quarterback Baker Mayfield was arrested early Saturday morning in Fayetteville, Ark. If the police report is accurate, Mayfield turned what could have been a fairly innocuous situation into an embarrassing (and most likely expensive) one that could result in discipline from the Sooners and will come up repeatedly when Mayfield leaves Oklahoma and tries to enter the NFL. The incident also allowed Arkansas fans to make a lot of “Somebody in Fayetteville finally tackled a mobile quarterback” jokes. 4. A Texas lawmaker is asking that the Texas Rangers, the state’s investigative unit, to examine the situation at Baylor to determine whether any laws were broken. State Rep. Roland Gutierrez, D-San Antonio, filed the resolution last week. If the Rangers investigated, it likely would bring much of the information Baylor has kept secret into the light because the results of such an investigation would be a public record. 5. I wrote a story for this week’s magazine on Daniel Faalele, an Australian who has yet to play in an American football game yet has more than a dozen FBS scholarship offers. Those dimensions in that tweet? Not a misprint. 6. The Georgia athletic department is trying to raise $500,000 to build a handicap accessible house for Devon Gales, the former Southern player who injured his spine during a game at Georgia on Sept. 26, 2015. Since the injury, Bulldogs staffers and players have helped Gales with his rehab. Now, they’d like to make sure he has a home that fits his needs. 7. Clemson defensive tackle Scott Pagano, who has graduated and plans to transfer to a new school for his final season of eligibility, has whittled down a long list of suitors and planned five official visits, Ryan Bartow of 247Sports.com reports. Pagano will visit Arkansas, Texas, Oregon, Oklahoma and Notre Dame. He’s also considering Cal and Nebraska. 8. Nebraska receivers coach Keith Williams was sentenced to 30 days in jail after pleading no contest to a charge of third offense DUI. Williams can apply for house arrest, and he would be allowed to work during that period. His driver’s license has been revoked for five years, but he can apply for an Interlock device after 45 days. Williams was also convicted of drunk driving in ’04 and ’09. Hopefully Williams will take this more seriously than he took the first two convictions. The lesson here is that if you’re a really good recruiter, it’s almost impossible to get yourself fired. 9. Matt Lubick’s cross-country coaching odyssey took him near the place where it started three months ago. Lubick served as Mark Helfrich’s offensive coordinator at Oregon. When Helfrich was fired, Lubick needed a new job. So on Dec. 23, he took a job as the receivers coach at Ole Miss. That lasted a little more than a week. On Jan. 2, Ole Miss announced Lubick was leaving. The press release claimed he was headed to Arizona State, but Lubick actually wound up at Baylor as a co-offensive coordinator. His stay in Waco didn’t last much longer. Last week, Lubick took a job as the receivers coach and co-offensive coordinator at Washington. If Lubick was a player, NCAA rules probably would force him to sit out his entire career for that kind of indecisiveness. 10. Mike Gundy and Barry Melrose talked mullets on ESPN. The happiest person on earth today? Steve Harvey. When Harvey accidentally crowned the wrong Miss Universe, it probably felt like no televised "here's the winner" gaffe would ever top that one. But thanks to the Academy of Motion Picture Arts and Sciences and its sloppy envelope stuffing, Harvey is no longer the go-to example. He can resume hosting Family Feud in peace. My wife is one of five children. Three of her sisters and her mother live within 10 miles. Her brother is only two hours away. All of the siblings have at least two children. That means there is a birthday party seemingly every week. There is always another cake, and that creates a dilemma. I’m certainly not giving up sweets forever, but I’m only four weeks into this thing. For the most part, I’ve cut out foods that contain flour and sugar (the processed kind; I’m still taking in sugar from fruit). This has kept me off the glycemic rollercoaster that used to make me want kneel at the end of a Krispy Kreme conveyor belt and let the doughnuts fall into my mouth. When I reach a more acceptable weight, I plan to incorporate reasonable portions of dessert food back into my diet, but I’m still several months away from that point. Unfortunately, I keep getting handed hunks of cake and I’m apparently not supposed to decline them. If I’m at a birthday party for one of my kids’ friends from school, it’s easy to politely decline. No one knows who has what allergy, and as long as the first-graders get fed, everyone is happy. Family birthdays work differently. My mother-in-law cooked the chocolate cake served Saturday from scratch. She knows I’m not allergic to anything in it. It would be rude to turn it down. That’s why my wife hacked off a piece and passed it along. I tried to say no. In return, I got that look that says “I hear the couch is a wonderful place to sleep.” The wife, who is in excellent shape and has much better eating habits than me, reminded me of one of my goals when I started this. “Don’t be weird about it,” she said. So I took a bite. The cake was so moist that it melted with the icing into a glorious sugar plasma that coated every taste bud. It was incredible. I finished my slice and tossed my plate. For the next two hours, I fought the urge to eat what was left of the cake as well as the cupcake versions of said cake that my mother-in-law had made for the kids. That’s exactly what I would have done in the past. But this is a new day, and I can have my cake without eating two (or three) slices.